Get a truly unique item for your jewelry collection and consider all that Apples of Gold's stunning Sterling Silver Script Font Name Pendant set gives. It is a beautiful piece that allows you to have a truly authentic item that you can show off and treasure for years to come. Sterling silver has long been used to make elegant jewelry pieces and that tradition continues with this scripted pendant. Choose a name and enjoy your pendant with any outfit you might be wearing- it goes great with business, casual, or formal wear! We have many fine sterling silver pieces, but one of the most popular is the Sterling Silver Name Pendant. Enjoy the luster and shine of the silver and watch as the compliments pour in! You can personalize this necklace with any name from 3 to 10 letters and comes with an 18 inch chain. 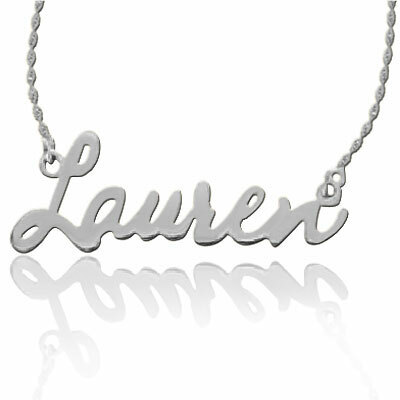 We guarantee our Sterling Silver Script Font Name Necklace to be high quality, authentic jewelry, as described above.